A German cyclist who already has two world records under his belt is taking on his hardest challenge yet in his quest for a third. Update: Jonas Deichmann completed his journey and plans on spending some time on a Brazilian beach before looking forward to his next adventure. 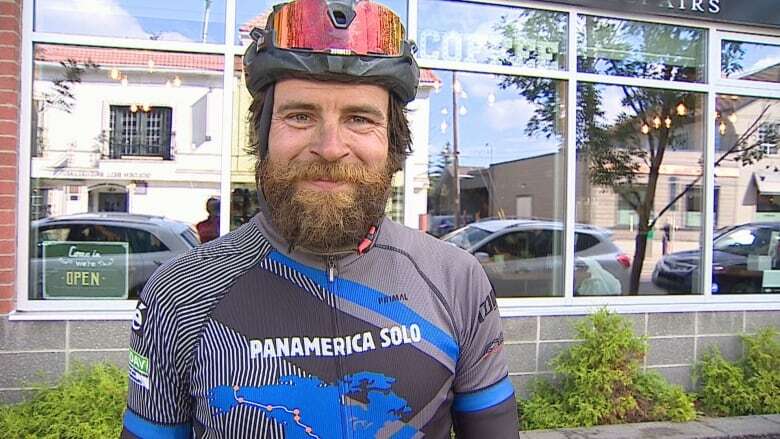 Jonas Deichmann is riding solo from the Arctic Ocean in northern Alaska to the southern tip of Argentina — a 23,000-kilometre journey that would earn him the record for fastest unsupported cycling trip of the Pan-American Highway. If he can do it in under 125 days. "I like the challenge and to push myself, but what I like most is actually the adventure," Deichmann said Tuesday, as he stopped in Calgary on Day 17 of his journey. His goal is to complete the trek in 100 days. "It was really tough in the north. The first 800 kilometres to Fairbanks on the Dalton highway was a terrible dirt road. It was raining, so I got stuck in the mud," he said. "And then the Yukon and northern British Columbia, it was cold and rain and headwinds all the time. So it was hard, but I'm a bit ahead of schedule." Deichmann has toured the world by bicycle — a feat he took on when he was a poor student without money who wanted to see the world on the cheap. His world trip took him 18 months, but gave him the idea to try and go for a world record. So far, he's set two. Both last year. He set a new world record for cycling across Eurasia by completing the 14,331-kilometre journey in 64 days. He also set a record for the fastest cycle across Europe, which he did in just 25 days. His Pan-American journey is his toughest yet. Between Prudhoe Bay, Alaska and Ushuaia, Argentina, he will cross all climate zones and terrain — from mountains and deserts to rainforests. "I think it's the most diverse and most difficult cycling route you can take on Earth," he said. Deichmann is doing the route alone and everything he needs is on his bike. He's carrying a small tent, sleeping bag, a mattress, spare parts, two sets of clothes and things for cooking. He carries two days of food on him on the bike and eats constantly, burning over 10,000 calories every day. At the end of the trail, Deichmann said he's most excited to rest. After his last record, he said it took him four to five months to fully recover and spent the first month sleeping 15 hours a day. He plans to recoup in a beach hut in Brazil and spend two months lying in a hammock.